Miami Project, a contemporary and modern art fair, will debut on December 4-9, 2012 in Miami’s Midtown/Wynwood Art District. 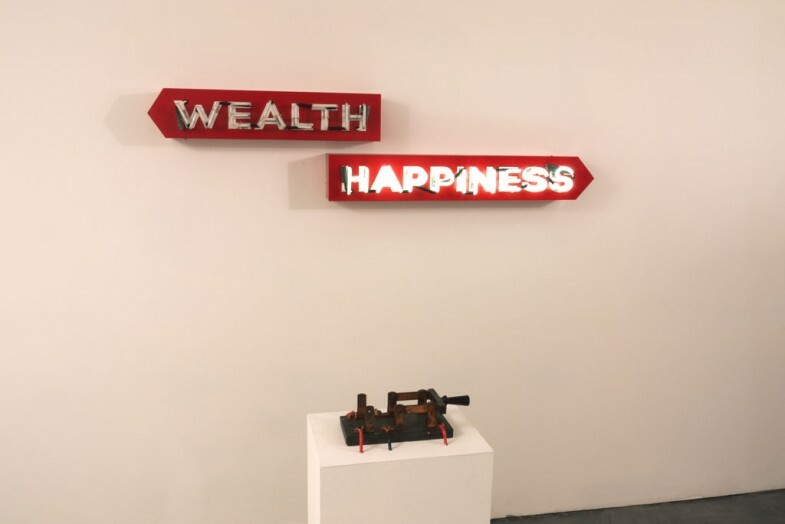 The Fair, centrally located at NE 1st Avenue and NE 29th Street in a 65,000 square foot modular structure next door to Art Miami, will feature presentations by 65 galleries from around the world. Art that steps out into the public space in order to call for social change is a relatively recent phenomenon in Russia. The development of this genre has evolved alongside the emergence of civil society in Russia, which has been accompanied by a rise of mass protests on the one hand and political repression on the other. In this case artists become precursors to and catalysts of social processes, but they also assume a heroic role as they go out into the street to confront the system. The festival presentation will include talks and screenings on Russian activist art as well as discussion with festival participants and audience. Participants: Alina and Jeff Blumis (artists, New York), Andy Bichlbaum (activist, New York), Andrew Boyd (activist, New York), Avram Finkelstein (activist, New York), Ilya Falkovskiy (artist, Moscow), Nina Felshin (curator, New York), Steve Lambert (activist, New York), Maria Kalinina (curator, Moscow), Anya Sarang (activist, Moscow), Tatiana Volkova (curator, Moscow). In collaboration with the Center for Artistic Activism. 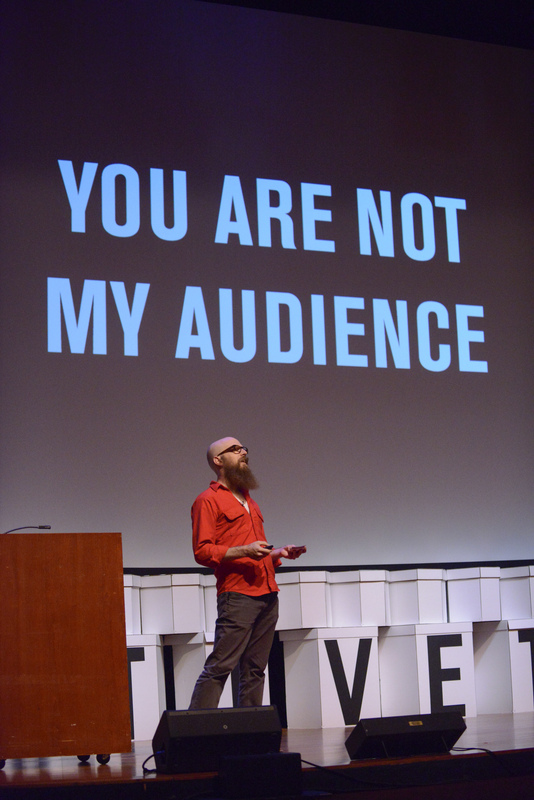 Media Impact presentation in the US is made possible in part with funds from CEC ArtsLink. In the last few years we have witnessed how the corrosion of the three main modes of social imaginary that defined modernity — the market economy, the public sphere, and the self-government of citizens — has reached a critical point. As a result, the increasing number of people in different fields, social scientists, artists, public intellectuals, and activists are calling for rethinking and reinventing social change. Such voices, however, are too often fragmented in their respective boundaries, and, consequently, they have not yet been able to articulate a compelling alternative metanarrative that the public would identify with and which would thus result in a major positive change. Co- Re-Creating Spaces surveys how artists are questioning and subverting existing contexts or spaces and contributing to their re-imagining and re-creation. The exhibition recognizes that “reality” itself can be both art medium and art object, and speculates how developments in the virtual and the actual might affect one another. The exhibition will include works by Morehshin Allahyari; Nadav Assor; Amy Balkin; Aram Bartholl; Zanny Begg & Oliver Ressler; Linda Bilda; Irina Botea; Martha Colburn; eteam; Cao Fei; Yevgeniy Fiks, Olga Kopenkina, & Alexandra Lerman; the Institute for Wishful Thinking; Cassandra Emswiler, Kristen Cochran, & Greg Metz; Martha Rosler; Dread Scott; the Yes Men/Steve Lambert; and Karen Weiner, with Celia & Frank Eberle. Curated by Carolyn Sortor & Michael A. Morris. Spaces blog or facebook page. The two poster campaigns in “Defeat the Ghosts” re-connect Alabama’s civil rights history to present day immigration issues. Several hundred of these were posted and distributed around Birmingham just before the 2012 election. As if ghosts themselves they appeared in the middle of the night, seemingly stepping out of the past while addressing the present. Alabama has a deep and vital history in the Civil Rights movement — events to be proud of, as well as events to be ashamed of. While the struggle for civil rights is ongoing, in many ways, the idea of civil rights has culturally receded. Seen through the lens of mainstream culture, the fight for civil rights in the 1960’s is often portrayed as though it was simply history, and is not currently relevant. This is not the case. In Alabama, as elsewhere, civil rights is a contemporary issue. In 2011, Alabama adopted HB 56, one of nation’s strictest anti-illegal immigration laws — tougher than Arizona’s notorious SB 1070. This is no coincidence. The same author, Kansas Secretary of State Kris Kobach, authored both laws. HB 56 has had unintended consequences for immigrants and visitors of all kinds. Legal residents and legal workers have left the state. Across Alabama, there were reports of increased general hostility toward Latinos, but they were not the only ones caught up in the atmosphere of intimidation. A German Mercedes-Benz executive was arrested for not having adequate documentation of his citizenship. In a separate incident, a Japanese Honda executive was ticketed at a checkpoint for not having a state ID. The consequences of HB 56 have drawn national attention. For example, the nationally syndicated radio show, This American Life, highlighted HB 56, and it was the subject of articles in newspapers throughout the country. During my residency at Space One Eleven I visited Kelly Ingram Park in Birmingham. While looking across the park, my hosts told me, “this is where the Children’s Marches happened.” I looked over at the 16th St Baptist Church, and realized I was standing where Bull Connor used fire hoses and police dogs on the children during the SCLC’s Birmingham Campaign. I had learned the history, but it was an entirely different thing to stand on the same ground. There are many events that are significant to Alabama’s civil rights struggles — the Montgomery Bus Boycott, the bombing of the 16th St Baptist Church, and Martin Luther King’s Letter from a Birmingham Jail, just to name a few. Yet, I was surprised to find Alabama voters do not seem to connect the dots to today’s struggle over immigrants’ rights. In our collective effort to put the shameful parts of our past behind us, we are also losing some of the lessons. From his membership in the Klan in the 1920’s, to his infamous role in the Birmingham Campaign, Bull Connor was consistently on the wrong side of history. One could rightly say he was on the wrong side of humanity. Connor never apologized for his appalling actions before his death in 1973. He went his grave as a villain. True villains are rare — it’s hard to find a person who is clearly a “bad guy” without remorse or regret or some way to elicit a degree of sympathy. As a result, no one wants to be associated with the legacy of Eugene “Bull” Connor. Villains have weight in our culture and that weight can be leveraged. Unfortunately, Alabama lawmakers positions are more in common with Bull Connor’s than anyone would comfortably admit. The project consists of two letterpress poster campaigns. Both seem to have appeared from the 1960s, but upon closer examination, addresses issues relevant to today. 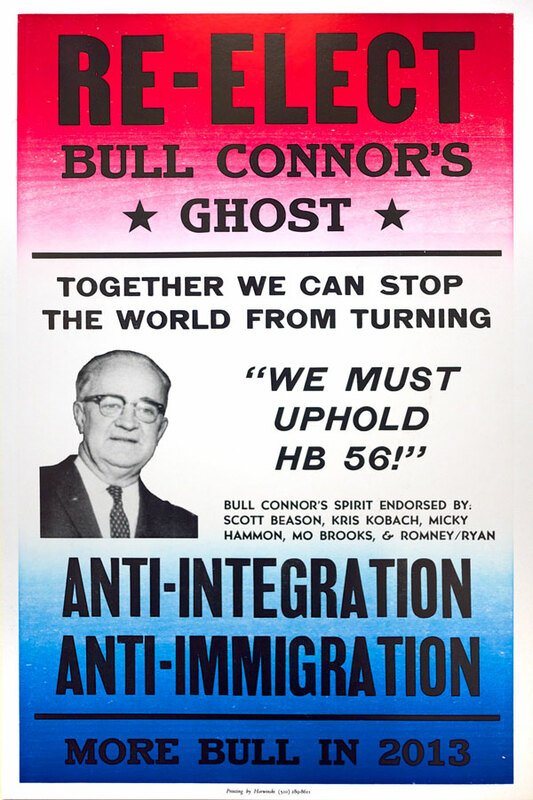 “Re-elect Bull Connor’s Ghost” communicates the idea that if Bull Connor were alive today, he would be on the side of politicians like Scott Beason, Micky Hammon, and Mo Brooks. These men have pushed retrograde laws like HB 56, and cling to a clichéd mythic American past that never existed. The project also highlights the legacy of anti-integration politics and it’s connection to today’s anti-immigration policies. “Defeat the Ghosts” is the more hopeful of the pair, addressing the legacy of racism that continues to haunt Alabama. The design is more modern, in contrast to the Connor poster. The main message is that we must “defeat the ghosts” and overcome fear and illusions. It also illustrates the concept that the dead ideas of the past continue to prevent the Alabama, and society as a whole, from moving forward. The prints were put up simultaneously around Birmingham, Alabama, just prior to the Fall 2012 election. 3 videos encouraging people to vote in the election were made with my My It’s Time to Fight and It’s Time to Stop Fighting show at Charlie James Gallery as the backdrop. One light flashed on the 100% sign, unless you can organize a group of people to watch over it, then everything starts to work.